This day, 11 years back, was when Mumbai came to a standstill. Rainfall reached the 1000mm mark after showering 22 hours non-stop. Power was cut, people were stranded and cars were submerged. For the first time, the Mumbai Airport remained closed for more than 30 hours. It was my third year studying engineering away from home, at the hostel. Below is my experience surviving alone and getting back home as jotted that day in my 2005 journal. 14:00 Heavy rains have just begun. College was as usual. 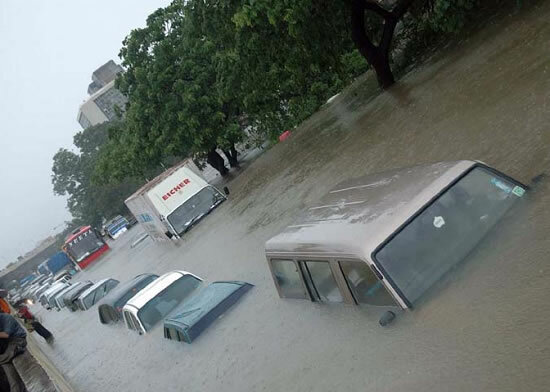 Dad reported heavy rains in Mumbai. Reached hostel & went to sleep. 17:00 Woke up. No water supply. No electricity since 15:00. Water has risen 1/2 ft above the road. Trains have already stopped. 19:00 It’s raining heavier. Water level up to 3.5 Ft in some places. Going for early dinner. No way to speak to Mumbai with mobile & landline networks already down. 20:00 Finished dinner at the only one open. Shopkeepers are busy applying plaster of paris or white cement on the shutters. Water level has risen to 1.5 ft on the road. 21:00 People living in the A-type houses & B-type apartment ground floors have begun evacuating as water level inside the rooms is above 3 ft. Nothing else to do, so off to sleep. 01:30 Heard people screaming & animals crying. Lot of noise in the hostel. Woke up to find water was already 1.25 ft into the house, about 4.5 ft above road level. Together with the boys, we started moving the landlord’s refrigerator, washing machine, dressing table, television, computer, clothes, mattresses, grinder & other things to the 1st & 2nd Floors. 03:30 Done moving. The water level on the road is well above 6 ft and from the terrace, it appeared as if we’re on an island. People and animals continued to moan. Hitting bed now. 05:30 Mosquitoes are killing me. 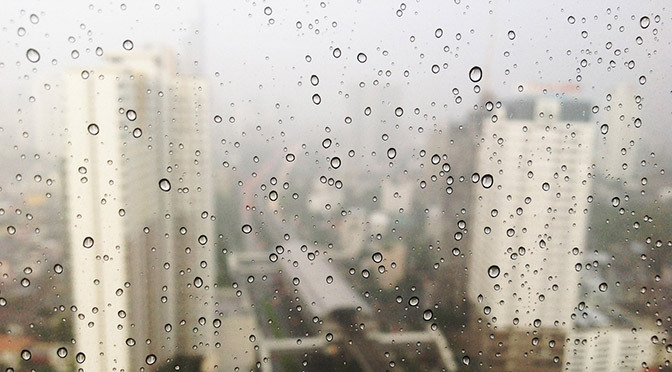 Rain falls with the same intensity. 07:30 It’s noisy again. Heavy rain continues. Saw people roaming on the roads. People that had fled at night were returning home bare footed, carrying refrigerator doors, bikes & whatever that had flown with the water current. There was a 6 inch layer of mud inside some houses. Cars had flown up to 250 meters with the water. Some got crushed under collapsed walls or some others destroyed after banging electricity poles. 09:30 Water level subsided to about 2 ft on the road. Going out to find something to eat. 09:45 Everything is shut. Shops that have opened are busy flushing the water out. Hundreds of people are roaming to find lost ones. Heard that the water level rise was due to opening of some channels of the Gadeshwar dam due to increased hydrostatic pressure. This causes the river adjoining Panvel to flood. The police were encouraging young people to come out & help the needful. Had to purchase junk, packaged food and return back. 12:00 Everyone in the hostel gathered on the terrace to share their experience. The most common was seeing dead bodies and crying people. Buses had resumed services up to Vashi. A lot of students had stayed back in the college and some others found the help of local friends. Everyone was trying to contact home & get some food. Finally Umesh’s Reliance phone managed to connect to the PEN loop and everyone took turns to call home. My dad reached home at 02:30 after leaving office 15:30 the previous day. Mom was still in office but my brother was safe home. Things were beginning to dry up after 21 hours of continuous rainfall. We shared whatever we had to eat. But there was no water to quench the thirst. 14:00 Everyone had hungry again and we went out looking for food. We checked every other shop. Nothing was available. All ATM’s had closed down since there was no electricity. 15:00 After walking for a mile, we finally found a restaurant open. All they served was a small plate of Mix Vegetable Pulav (rice) with curds for Rs.40 (we used to pay that for a full Tandoori chicken at Babu’s). But we had no choice. 15:30 On the way back, we saw an auto-rickshaw crushed between a Maruti Esteem and an electricity pole. All dust-bins were emptied and the dirt was on the road. People had thrown jute bags full of rice, wheat & pulses, vegetables & other food items that had gone waste. 16:00 Met some other friends who had helped localities get water out of their houses. They said they had heard on the radio that some channels of the dam were going to be opened again to relieve the water pressure. Electric supply was going to remain down for another 3-4 days. We were convinced that we had only seen the tip of the iceberg and that living in Panvel was impossible. Police did not have any information about the dam and weren’t particularly responsive. 17:00 Everyone was thinking about going home. But with limited information about transport options, we couldn’t predict if we’d make it home. I had already given a word to my parents that I won’t leave the hostel. But unavailability of electricity, communication, drinking water & food was changing my mind. 17:30 I’m convinced about leaving. I packed my bag with a couple of books, removed all accessories, took my ID and left home wearing shorts. We were seeing people throwing more food on the roads and leaving houses taking whatever that was at hand. Not a single auto-rickshaw was available. Although most of the people on the roads were helpful, many cars, tempos & trucks that were going empty refused to offer help. 17:50 We had reached the State Transport (ST) bus station at Old Panvel which was flooded with people. Buses traveling both ways were overcrowded. A friend who just arrived from New Panvel said it was officially being announced that some channels of the dam were going to be opened. Despite of no rains, the current water level risked overturning the dam and throwing things out of control. I’m hell bent on leaving Panvel. 18:00 Some things are God-gifted, and so was the bus that arrived. 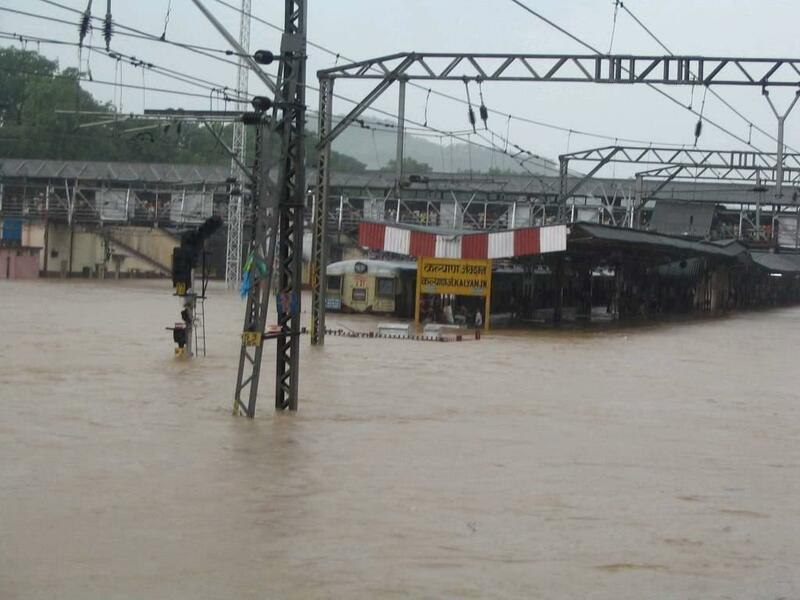 It was an unscheduled bus, arranged from Mangaon for Konkan Railway passengers who had to get off the train. Lucky enough, it was direct to Borivali and we found place to sit. 18:30 The bus was moving at a good speed. Water had clogged around Khandeshwar and a bit in Kharghar. Beyond that it wasn’t too severe. 19:00 People were seen walking on the railway bridge across the Vashi creek. We’ve already reached Mankhurd, and even a part of BARCis dark. Traffic was smooth up to Maitri Park, Chembur. Finally seeing some lights. 19:15 We’ve only moved 10 metres in the last 15 minutes and water has clogged at some places. 20:15 Another hours and still there. About 10 BEST buses have broken down and parked on the side. 21:15 Traffic is moving bumper-to-bumper and we’re still around Sion. 21:45 Passed Sion Circle. Traffic was well managed and kept moving into Dharavi to join the Western Express Highway at Kala Nagar. Mobile networks are back online. Out-going calls could be made after a couple of attempts. Pending messages began to arrive randomly along with delivery reports of messages I’ve sent to loved ones. I got a message saying that Mom had reached home safe; I was very relieved and did not care about the traffic anymore. 22:15 Traffic comes to a stand-still at Kala Nagar on account of unattended cars. People left them on the roads the previous night and walked home. Inspite of efforts of the police & social workers, cars are not moving at all. 22:35 We heard that Western Railway had resumed service and that the Western Express Highway was jammed all the way. Anyone who’s lived in Mumbai knows how reliable the train system is. So we got off the bus and walked to Bandra station. There was very little water & a lot of people were there on the roads. 22:55 We reached the station and realized that services were offered both ways, ie towards Churchgate & Virar. We got a ticket and approached a local train departing for Virar at 23:15. Western Railway had also arranged for a lot of out-bound special trains. 23:10 The train departs on time. Most of the people in the train are frustrated, returning home after a couple of days. Train moves steadily and reaches Goregaon around 23:30. 23:35 Got into an auto and called Mom to tell her I was coming home. 23:45 Stepped into the house after 6 hours of travel. Had a bath that was pending for about 30 hours and got into bed at 01:00. An eventful day comes to an end. The entire experience was unpleasant. More news uncovered the next day. Some pictures made you puke and others brought tears. People were seen walking in water above their waists. Most of the people had not seen home for a couple of days and were not even able to communicate with their families. Railway platforms were full of commuters in the day and the night saw those left sleeping there. 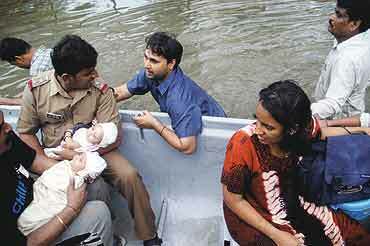 The entire episode was taken into control because of the help offered by the people of Mumbai. People have done everything from eliminating traffic to providing tea & biscuits for those who were walking home at night. If these people had decided to stay at home, no one else could make it home. Also, for the Public Transport agencies like the BEST & State Transport that operated in & out of the city when no one else did. In spite of the several buses that had broken down, services continued giving people a hope to reach home. The railways also did a great job by continuously working on the damaged equipment and resumed services within 24 hours along with some special trains towards other cities. The Police & the Fire Brigade also played an important role to keep things under control. At certain places, the Fire Brigade also helped to pump stagnant water. As a Mumbaikar, I sincerely thank all those who have helped even in their own way. If it had not been for the helping hand that the people offered, life in Mumbai would have continued to remain at a standstill. Although a relief fund of Rs.500 Crore has been declared by the President of India, I am not sure whether the money will be spent for the right cause or turn into another scandal. Were you in Mumbai that day? Feel free to note your experience in the comments below. Speaking of survival, you might like reading about my camping experience in Musandam or bag-packing experience in Turkey.